We do deal in used motorcycles, but we have also seen a rise in Harleys coming in for trade-ins since Indian showed the Chief in Sturgis," says Sam Kiley of Indian Motorcycles of New Jersey. In the middle of the showroom floor sits an Indian Chieftain waiting for me to get on and become the first Indian to ride the new Indian. For me, this completes a full circle. Ages ago, I was privileged enough to swing a leg over a genuine Indian Chief from way back when and ride around for a short while. It took me a while to get used to the unsprung throttle (on the left hand), ignition advance/retard where the throttle usually now goes, a hand shifter and a six-position foot clutch. But once I got going, the old Chief was impressive. It was smooth, torquey, even regal, and in that sense, the name really fitted it perfectly. And now, I've an all-new Chief to ride, one that is as modern as humanly possible but without being completely at odds with its history at the same time. That is quite an achievement. 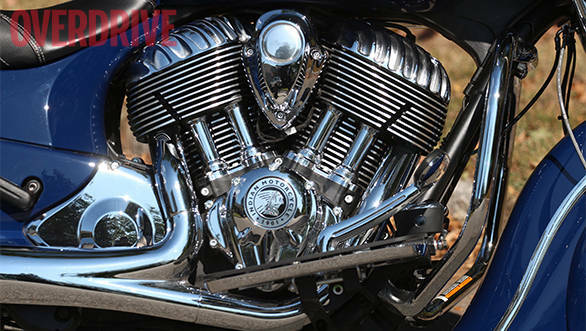 The story goes that when Polaris acquired the Indian Motorcycle Company, they had the Powerplus engine-powered Chief in the kitty. But they were also at the time thinking about a new product. The famous Scout did come up, but it quickly became clear that the Chief was the model that had to lead the resurrection. 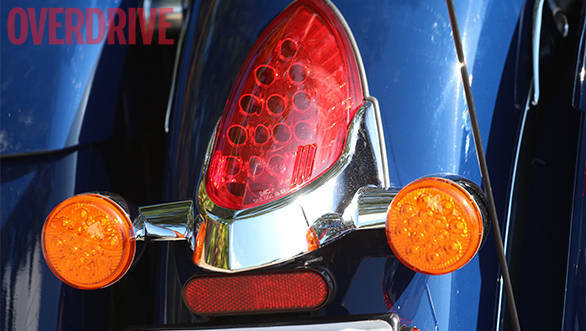 And, that it wasn't as much the famous valenced-fenders as it was the distinctive look of the engine that would determine the Chief's identity and its link with the present as well with its complicated past. Meanwhile, Sam was trying to gain my attention. He quickly ran me through the bike's features. A central ignition button (like a computer's but way larger) starts up the electronics once the key fob is in range. "I'm just going to leave the fob in the pannier, ok? You're probably not going to need it at all." In the real world this means that your keys remain zipped safely in a pocket in your riding gear and there isn't any need to actually use it on the motorcycle. Below that is a rocker switch that works the locks on the two quickly removable, well-made, spacious panniers. The Classic, the next lower model, gets similarly quick-release panniers in soft leather ? no remote locks, obviously. The left handlebar switch set (yay, normal indicator switches!) has a second set of switches underneath that work the MFD screen placed between the two circular meters and has a "power window" style switch that lowers and raises the screen. On the right grip is the usual high/low beam switch, the engine kill switch and ignition. I start up the bike outside and it settles into a lovely, throaty idle. The tyre pressure monitor (yes) reports that both tyres are good to go. I quickly slip into my kit and settle into that soft leather saddle. I was told that Indian has managed to use this genuine leather that is ultra-soft to the touch, and it's spot on. Over the next three hours, the saddle would never make itself noticed, which is a huge compliment to how comfortable the Chief is. Hefting the bike off the sidestand reveals that this isn't a slight motorcycle in the least. 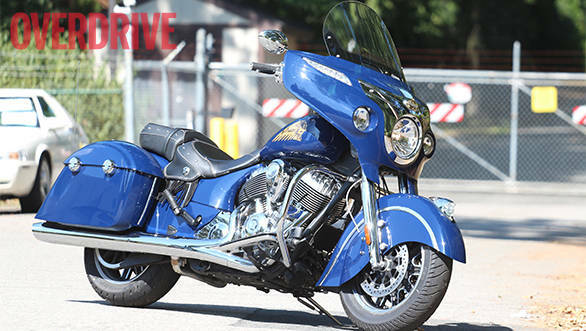 Big-boned and generously proportioned, the Indian Chief is a full-size cruiser. But once the weight is on its wheels, most of it seems to vanish, especially once you get rolling. Usually, a big wide-barred cruiser requires a five-minute adjustment, while you get used to the steering. But the Chief is all-natural. I was surprised at how confidently I executed the U-turn in the showroom parking lot before heading out into a busy stream of traffic. Then comes my first whoa moment. The road ahead is very busy and in the US you are required to yield to moving traffic ? sit and wait till a gap appears. In my case, a car slows to stop as soon as I roll up to the stop line. The chap inside has a mile-wide smile, two thumbs up. Completely unaware that he's holding up traffic, perhaps for miles, he waits for me to roll forward and join traffic. I can understand that reaction. For the Chief is spectacular to look at. 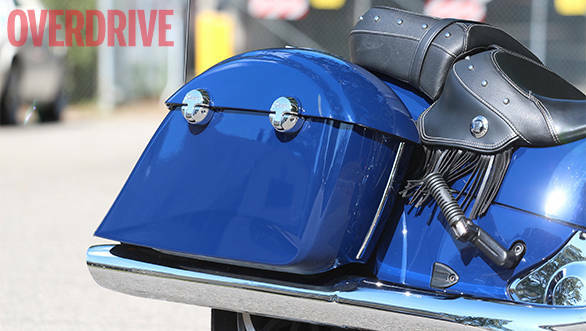 The valenced fenders give it a distinct identity and there is something about the shape and profile of the tank that tell everyone that this is an Indian and not a Harley. 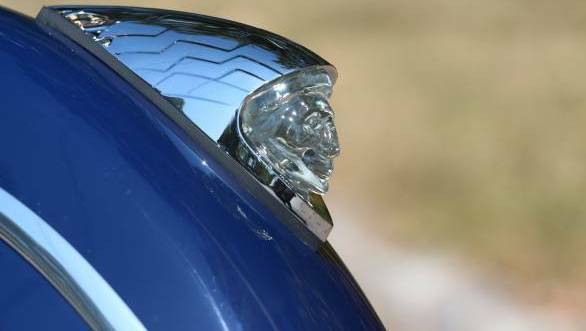 Plus, of course, there is a famous Indian headdress logo on my dark blue tank as well as an illuminated "war bonnet" (the official name of the Indian head adornment on the front fender). All this is well-made, exquisitely finished and wonderful to look at. Plus the Chieftain, the top model, gets this huge "batwing" fairing, which houses the adjustable screen, audio system, most of the electronics and more. Again, Indian spent a long time ensuring that the weight of the batwing and all it hosts doesn't make the Chief too much of an effort to steer. If the U-turn is any indication, their engineering has borne sweet, juicy fruit. Coming off the busy highway, I turn off onto a smaller road that is supposed to lead, appropriately enough, onto an old Indian reservation. Had the road not been blocked a few miles on, I'd have become the first Indian to ride an Indian Chief on an Indian reservation. Oh Chris Columbus, what a story your error in naming the natives would have led to today. But I end up on a windy street, a deserted road that borders the Galloping Hill Park and Golf Course. Honest, I'm not making any of this up. The Chief is proving to be really, really impressive. The 161.6Nm, 1811cc V-twin, I swear, burns petrol but runs on silk. When you open the throttle, the sound is melodious, and at once, very, very distinctly different from a Harley. Once you hear it, you'll never mistake the Chief's note for anything else. 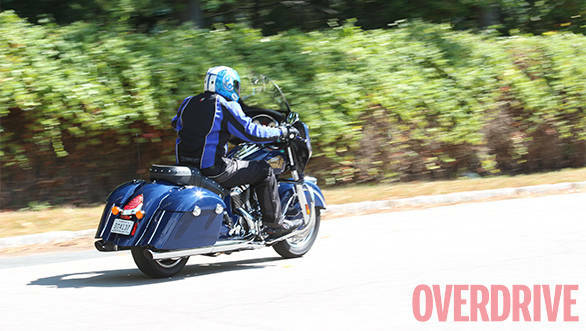 Even on full-throttle acceleration, the Chief feels pretty fierce for a cruiser, gets louder and more urgent, and, strangely enough, retains that smooth, silky sensation. It isn't like it is vibe-free like a Goldwing, but the vibration in the bars and footboards feel wonderful rather than annoying or extant. I've never ridden a cruiser that felt this sort of smooth. Absolutely lovely. Or for that matter, that felt this sort of urgent. Which is the cherry on top of the absolutely lovely. You can sense how much attention has been paid to the development of Chief in every aspect of it. I did have to go through some pretty ragged roads on my ride, and the Chief absorbs it with that heavy-handed sensation just like any cruiser I've ridden. But what it retains is a sense of comfort unlike anything else. It's quite a feat. Then you notice that the top model, the Chieftain, also gets more rear suspension travel as well as pneumatic pre-load adjustment for a plusher ride than its two sister models. But the other star of the show, engine apart, is the handling. 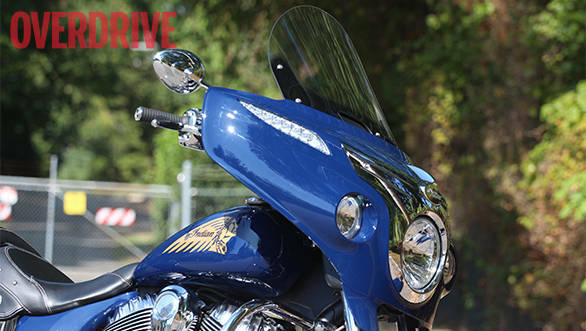 The Chief uses a modern, aluminium frame, which even has pass-through ducting for the airbox. The development stories that followed the reveal of the Thunderstroke 111 engine were full of how carefully the Chief has been developed. In there were nuggets like the included lights (on the Classic ? the base model) were included so that Indian could control the placement of their weight. To enhance the steering feel. To ensure the Chieftain does the business, it gets sharper steering geometry than its two siblings as well as a shorter wheelbase ? that last bit via a negative fork offset. That kind of focus creates a stunningly capable handling platform. Yes, I am still talking about an eight-foot long motorcycle with a wheelbase the length of a minor district road. You see the hints of the capability in things like the narrow footboards. They are comfortable, but not wide. As Sam said later, "And that's why the Indian can be cornered way, way harder than the nearest Harley competitor." This is true. The Chief is happy to be laid over into corners and for a cruiser it actually turns quite quickly. That sense of a hefty motorcycle leaning gracefully over into corners is replaced by the feel of a large motorcycle that is incredibly light on its feet and able to take lean angles on with great feel and speed. In the middle of the corner, leaned all the way over, hard stuff is harder to scrape than it looks and the silky power from the engine allows dramatically quick corners exits. The Chief would be as happy thrumming down the relatively straight Route 66 as it would be flung rapid and hard down the famous Deal's Gap. Let us be honest, the Route 66 loveliness I was expecting, the ability to take on the Deal's Gap and come out the other side smiling and shining, I wasn't. An American cruiser doesn't really need to be this good. If it can hold its own in a bar parking lot, hold a good 80mph (130kmph) or so down the highway the whole day it has already handled 99 per cent of its work load. 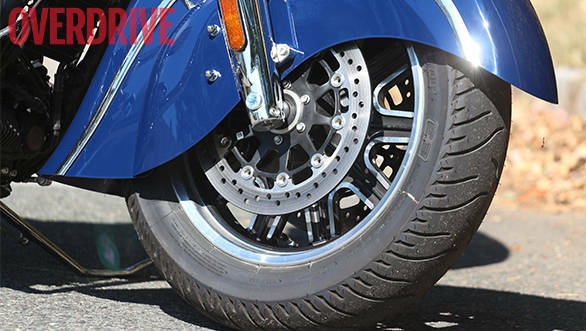 In this sense, the cruiser is neither a complicated motorcycle to make nor does it have a performance envelope that requires significant engineering work. But it is as if the people at Indian simply don't know this. They've managed to go and make a cruiser that will do both the profiling (Americanism for thundering slowly down Main Street) and the open road. But with a genuine performance envelope that extends beyond the glory shots in the ads. What makes this truly epic is that all this happened in just 27 months, which is a tremendous development schedule by any standard for a ground-up, all-new motorcycle. Or maybe the chaps at Indian understand more about the brand that we know. Because Indians weren't just great cruising motorcycles. They have a performance history too and were among the most innovative brands in motorcycle history in their heyday. And the Chief knows it. 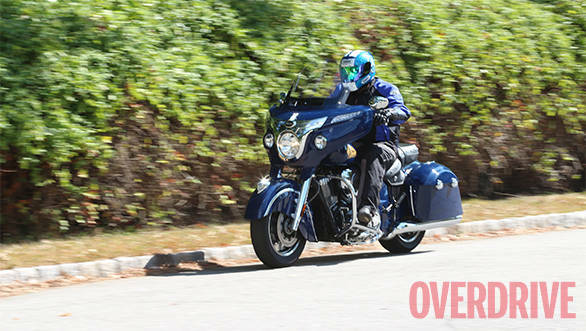 OVERDRIVE broke the story that the new Indian Chief was on its way to India, and it is perhaps appropriate that we are now the first magazine to ride the bike. What we know is that Polaris India is set to expand into the motorcycle space next year and the Indian Chief will lead the charge. 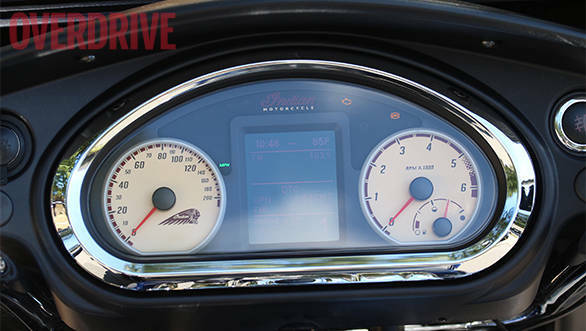 Victory motorcycles will follow, as will subsequent Indian motorcycles. Indian has always competed with Harleys, including the phase in the '20s when it was the world's biggest motorcycle maker. HD took over post the World War when Indian fell on hard times. 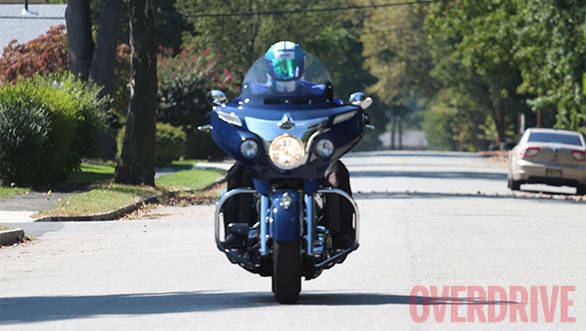 Since then, Harley has dominated the cruiser space and no one, so far, has made any serious headway in that space. I think the Chief is the motorcycle that could change that. We also rode the Indian Chieftain here in India. You can read all about it here.